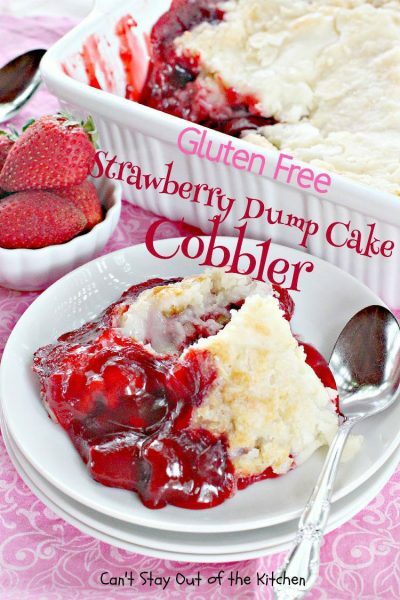 Gluten Free Strawberry Dump Cake Cobbler is amazing. Not only that, I used a gluten free yellow cake mix! If you’re familiar with dump cakes this recipe follows that tradition. I poured three cans of strawberry pie filling into a baking dish (pie filling was also gluten free). Then I topped the pie filling with walnuts and coconut, followed by dry cake mix. Then I melted two sticks of butter and drizzled it over the top. 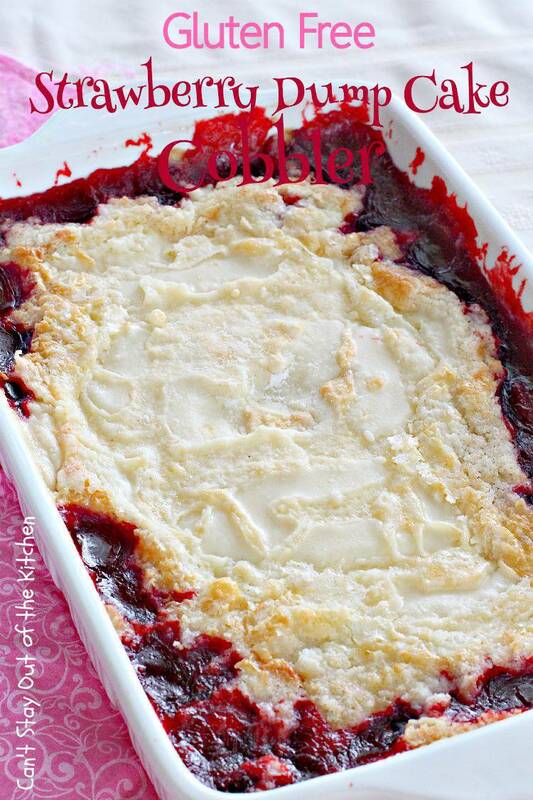 Bake for about an hour and you have a wonderful cobbler-type dessert. I have a friend who has full-blown Celiac Disease. Her condition is so bad that she can never use a bread board that’s been used to cut wheat bread for anything that she eats. If a knife has been used to slice wheat bread and it gets used to slice gluten free bread, she will get violently sick. Same goes for serving spoons….you get the idea. It took years and many humiliating incidents before the doctors finally diagnosed her disease a few years ago. So when she volunteered to have a huge Italian potluck fellowship at her house for our Sunday school class last Sunday (we ended up with between 60 and 80 people there), I promised her that I would make one pasta dish, one pasta salad and one dessert that were completely gluten free. There are actually several people in our class that are on gluten free diets so it was a win-win for everyone. There were a lot of people at that party who have no issues with gluten or any other food allergies and who eat anything on demand as well. 🙂 Almost everyone who even sampled this lovely cobbler came up to me and mentioned how great it was. When they heard it was also gluten free they were amazed. I found a box of King Arthur gluten free cake mix at Wal-Mart! It wasn’t cheap–about $3.50 per box. But a promise is a promise and I wanted my friend to be able to enjoy a delicious dessert. 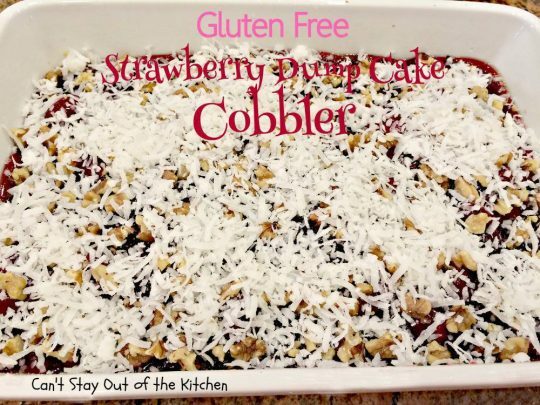 I had been thinking about making a gluten free version for several weeks, ever since I made several Strawberry Dump Cake Cobblers in Arizona when we were on our mission trip to a Navaho reservation in June. 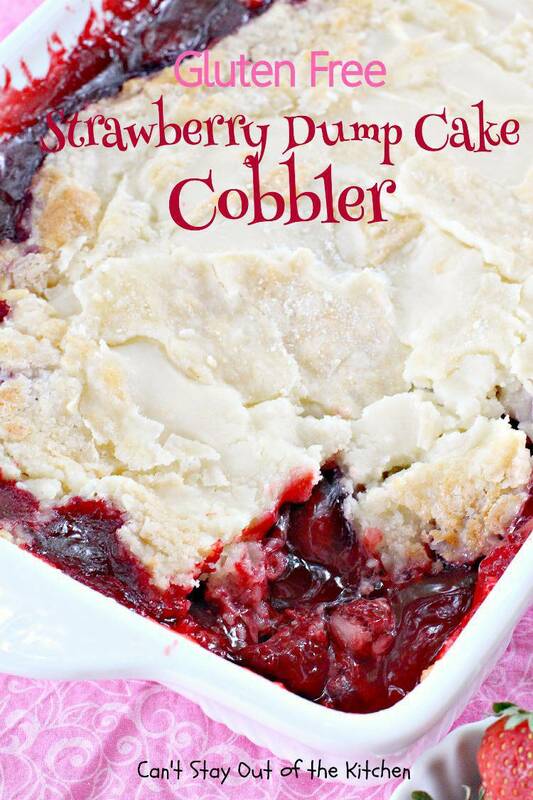 When we were there, I even made one cobbler using strawberry pie filling and two cans of sliced peaches and it turned out just as well. 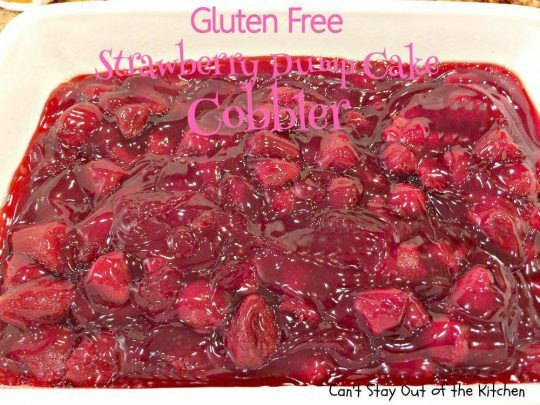 It was gobbled down just as quickly as all the other cobblers I made. While those cobblers used regular cake mixes they were just as tasty as this gluten free version. 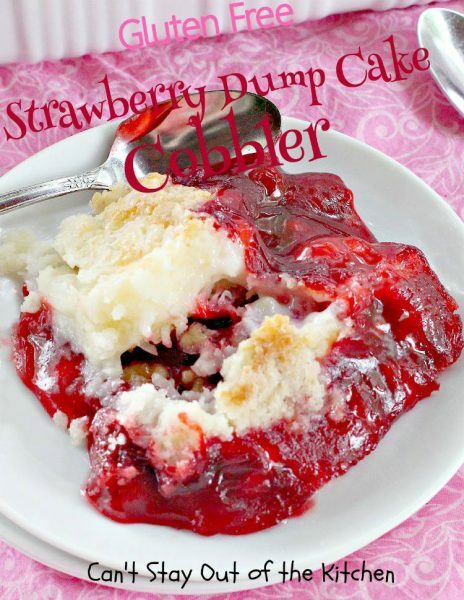 Our family has always loved dump cakes ever since the first time I ever sampled one. 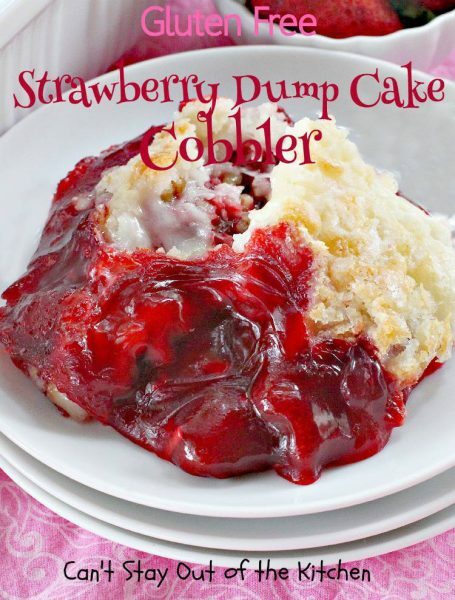 That particular dump cake had apples, peaches and pears and it was amazing. I will have to replicate it one of these days. John and I were newly married and we were at a Labor Day picnic with a bunch of folks from our church. One of the ladies brought that delightful dump cake and I couldn’t get enough of it. I gorged on two pieces among all the other stuff I ate that day! 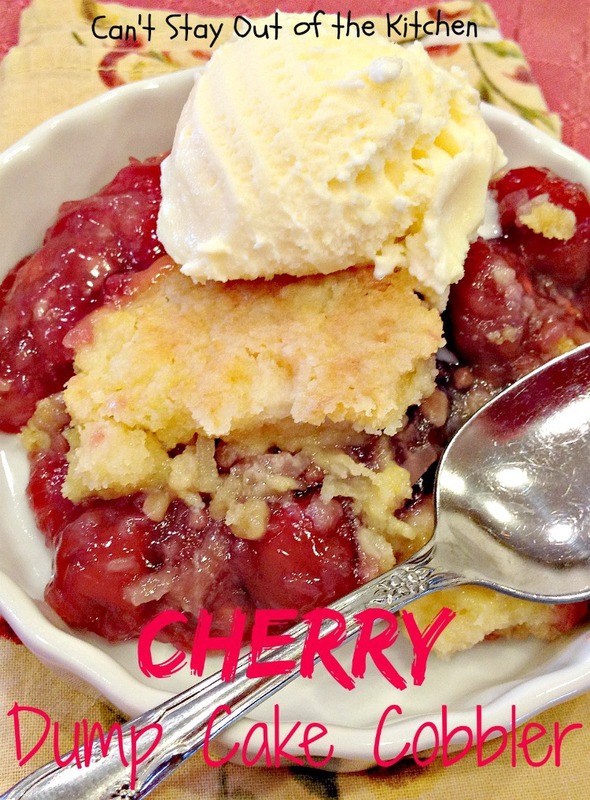 My mom made a lot of cobblers when I was growing up because she always had gardens and she had either fruit trees, fruit bushes or plants with berries and other fruit. John loves cobblers because he doesn’t like dry desserts (a.k.a. cake!). Unless it has a lot of fruit or ice cream, he’s not a big dessert lover. And now that our peaches have come in (we have six trees laden with peaches in our back forty), we have had several different kinds of peach cobblers! Those recipes are to follow. 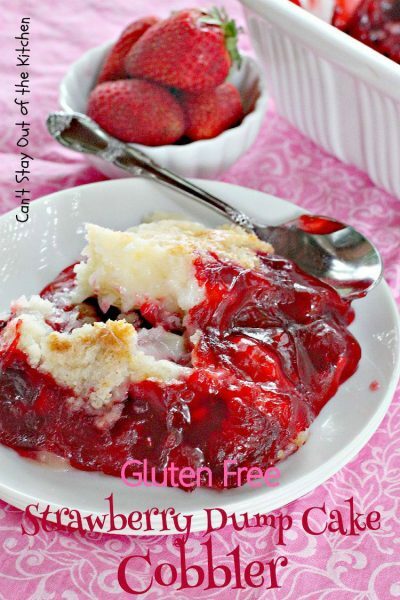 If you’re looking for a spectacular gluten free dessert, then Gluten Free Strawberry Dump Cake Cobbler is the recipe for you! It’s SO quick and easy. This recipe has only five ingredients and it doesn’t take more than 10 minutes to prepare and it’s oven ready. I usually bake dump cakes until the fruit pie filling is really bubbly, about 45 minutes to an hour so that all the cake mix on top gets absorbed into the cake really well. If you’re not gluten intolerant a regular yellow cake mix will suffice. For what it’s worth, even the kids enjoyed this recipe! Gluten Free Strawberry Dump Cake Cobbler tastes as great as it looks! Every mouthful of this dessert is delicious. You will be hard-pressed to realize you’re even eating a gluten free dessert! This dessert is yummy with a capital Y! The wonderful thing about Gluten Free Strawberry Dump Cake Cobbler is it uses only five ingredients. Grease a 9×13″ glass baking dish with cooking spray. 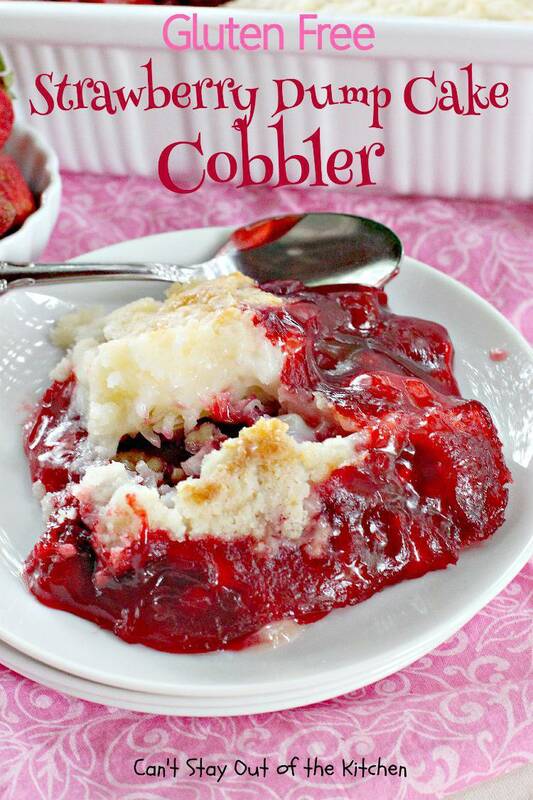 Pour 3 cans of strawberry pie filling into dish. Be sure to check the ingredients list on the back of the cans to ensure the pie filling is gluten free. Most pie fillings are made with cornstarch as a thickener but you’d better check to be sure. If you’re not gluten intolerant you don’t have to worry about it. Sprinkle finely chopped walnuts and coconut over top of the pie filling in the dish. 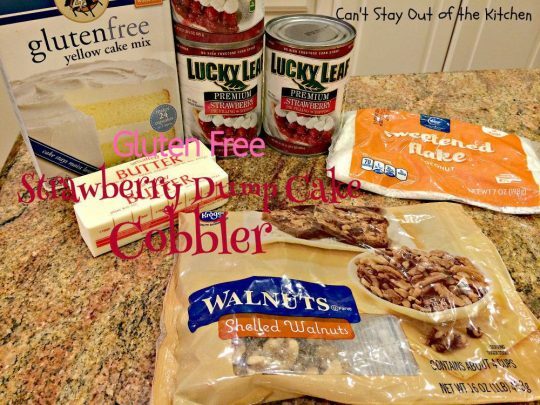 Spread gluten free cake mix over top of coconut. Then drizzle two sticks of melted butter over top of the dry cake mix. Bake at 350 for about an hour – until cobbler is bubbly around the edges and most, if not all, of the dry cake mix has been absorbed into the cake. Gluten Free Strawberry Dump Cake Cobbler is great by itself, or serve with ice cream if desired. Doesn’t Gluten Free Strawberry Dump Cake Cobbler look marvelous? This fabulous strawberry cobbler uses only 5 ingredients including walnuts, coconut and a gluten free cake mix! 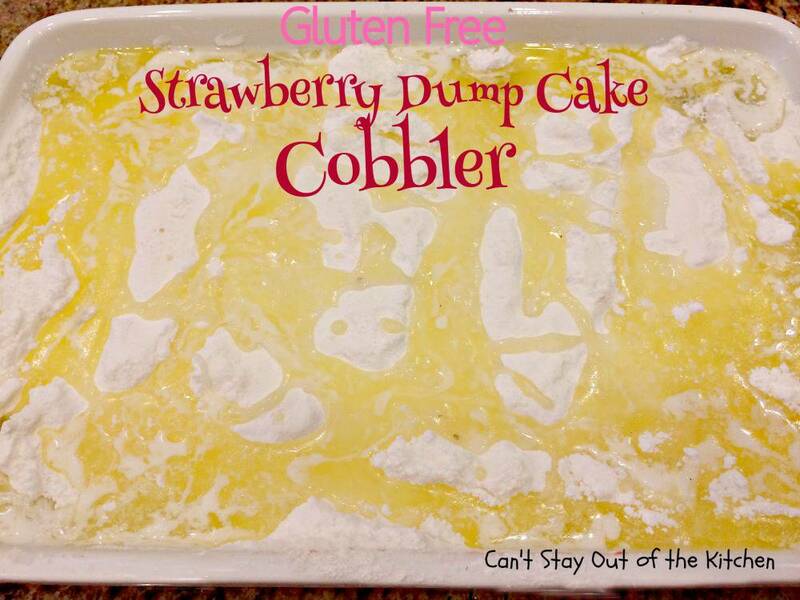 Great dessert for those with gluten intolerance. Pour pie filling into dish. Top with walnuts, then coconut. Sprinkle cake mix over top. Melt butter and drizzle over top covering the surface as much as possible. Bake at 350° about 45-60 minutes or until nicely browned on top and pie filling bubbles up to the surface of the cobbler. This recipe is so quick and easy to make. 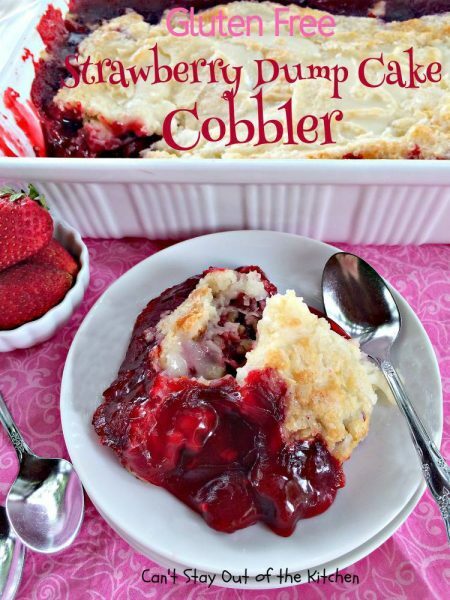 Gluten Free Strawberry Dump Cake Cobbler can be oven ready in ten minutes! Five if you’re fast! This dessert is so amazing. It’s even doubly amazing when you consider it’s gluten free!